Chamber of Commerce Week is the week of September 12th. What is your Chamber doing? Consider some of these ideas to help celebrate! Have a recruitment contest to see how many new members your current members can sign up. For example, recruit a potential NEW member during Chamber Week and be entered into a prize drawing. Offer a special rate for people who join during Chamber of Commerce week. For example, $50 off a new membership or offer a 16-month membership (the rest of 2016 and all of 2017) for the price of 12 months. Invite other Chamber professionals in your area to lunch; celebrate and network with them. Ask your Mayor for a local proclamation. Invite a member of the State Chamber to speak to your membership during this week. Hold an open house at your Chamber office to show the community what the Chamber does. Have coffee and cookies on hand. Submit a press release to your local newspaper. Invite Chamber members to meet you at member restaurants for breakfast, lunch, or dinner (eat somewhere different each time!) to talk with you about their Chamber experiences. Approach local radio stations to conduct interviews with Chamber leaders. 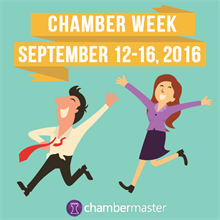 Remember to promote Chamber of Commerce Week all week on social media, too! Special thanks to the Illinois Association of Chamber of Commerce Executives and the following Illinois Chambers of Commerce for many of these great ideas: Oswego, Oak Park, River Forest, Galesburg, Elmhurst, and Aurora Regional.